Every year for the past 30 years we have held a winter hike for Scouts and their families and this year we were rewarded with frost and snow for the first time in years. 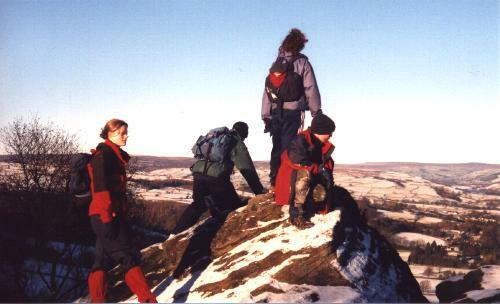 Only twelve of us managed to drag ourselves out of bed early on 29th December but were rewarded with clear blue skies when we travelled to Pateley Bridge/ From here we walked through Bewerley before climbing through Strikes wood to Gisecliff. On the way up Marting couldn’t resist trying a bit of sledging. He came prepared with a mini sledge strapped to the back of his rucksack. After stopping for lunch, Turkey and stuffing sandwiches etc, we dropped to don Glasshouse and Walked downstream for some more sledging!